To make these delicious stuffed cabbage rolls, start by preparing the cabbage. Discard the outer leaves of the cabbage, open up carefully its leaves and wash thoroughly. In a large, deep pot, add some water and bring to the boil. Take some of the cabbage leaves and blanch them in the boiling water; parboiling the cabbage leaves before rolling them will make them softer and easier to roll. Remove with a slotted spoon and place on a clean working surface. Repeat with the rest of the leaves. Once cool a little bit, remove the thick inner vein on the leaves and set aside (you will need them later). Prepare the stuffing for the stuffed cabbage rolls. In a large bowl add the ground beef, the rice, the chopped onions, the parsley, the dill, the egg whites and season; knead the mixture well, squeezing the ingredients with your hands, so that the meat absorbs all the wonderful flavours. Place one leaf on a flat surface (if it is too big, cut it in 2 or 3 smaller pieces), add a spoonful of the filling on the bottom centre of the leaf; be careful not to overfill the rolls, as the rice will expand during cooking. Fold the lower section of the leaf over the filling towards the centre; bring the two sides in towards the centre and roll them up (not too tightly). Continue with the rest of the leaves and filling. Layer the bottom of a large pot with the removed thick inner vein of the leaves (see step 1) and the smaller cabbage leaves that were too small for rolling. Lay on top the stuffed cabbage rolls, fold side down, and top in snugly packed layers. Season with salt and pepper and pour in the olive oil. Place an inverted plate on top to hold them down when cooking and pour in enough water to cover them. Place the lid on and bring to the boil. Turn the heat down and boil over medium heat for about 1 hour, until the cabbage is tender. Drain the remaining water and set aside. Prepare the lemon sauce for the stuffed cabbage rolls. Melt the butter over medium heat, add the flour and whisk to form a paste. Pour in the lemon juice and ladle slowly the milk, whilst whisking. Pour in 3/4 of a cup of the drained liquid and whisk, until the sauce thickens a little bit. 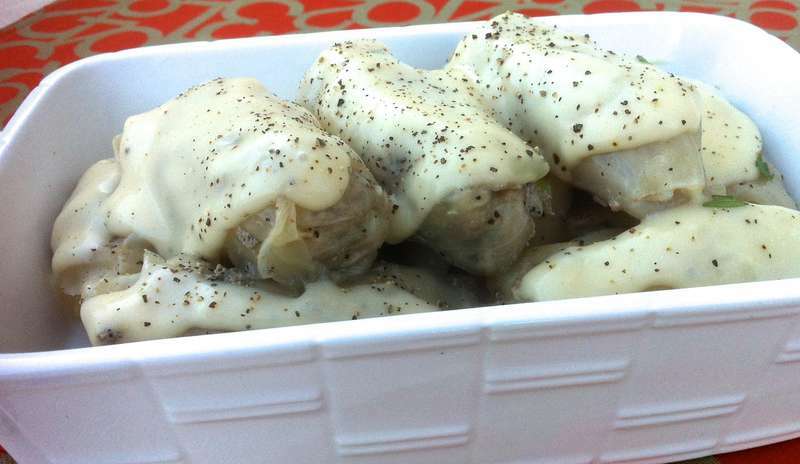 Pour the sauce over the stuffed cabbage rolls and season well with freshly ground pepper. Enjoy! What side dish goes well with these? These actually taste better the day or two after preparation. Don’t have to warm up. Try serving cold right out of the Fridge…..Hard to stop eating these things, Like Potato Chips !!!!!! So make up a large pot of them and eat for a week. You will not tire of them even after 5 or 6 days….. This is a yummy dolma. We call it ” lahana(cabbage) dolmasi(stuffed) in Turkey. Try to add some tomato paste to the stuffing. Scrumptious! Anyone ever try this using Chinese Cabbage? Seems it would be a lot easier than the regular Cabbage.